For months, I’ve fantasized about doing a quick, minimalist overnight on a Brompton. After all, what more perfect tool for a quick getaway than this stealthy, compact, uncluttered folding bike, with neatly fitted self-contained luggage options? What could be simpler? Pack a bag, hop a train, find a stop with good biking access to some bucolic location, get off, unfold the bike, clip on the bag and ride off on a delicious midweek escape, right? It turned out kind of like that, only not quite. Due to circumstances outside of my control, I was not able to take this trip during the warmer part of the season, and the two days I finally chose for my adventure happened to be the coldest ones since spring. This necessitated bringing a little more gear than originally anticipated, in the form of extra clothing, sleeping gear, and food heating gear, which in warmer weather I might have dispensed with (see this post for my complete gear list). However, I was still able to get all my belongings into a front-mounted Brompton T-Bag, and a small, not excessively stuffed backpack. In retrospect, I realized that I had put off this adventure partly because I could not carve out a time to do it all by bike. So take my advice: forgive yourself. Do what you need to do to get yourself out of the city and maximize the time you have available to enjoy nature and adventure on your bike. I was a little concerned about carrying an overstuffed T-Bag on the front of the Brompton, but I have to say that it handled admirably, although it was very perceptibly slower on the climbs. Oh, well. I wasn’t going for speed anyway. My routing turned out to be pretty impeccable up to a point (see below). I parked on a neighborhood street adjacent to the trail in Oak Forest (parking overnight in Cook County Forest Preserves is not allowed). I rode up Tinley Creek Trail following the east part of its northern loop. At its northern tip, I joined the Palos Heights Bike Path to connect to the Cal Sag Trail, which I took west. That connected —seamlessly, as it turned out, despite extensive road construction— to the I&M Canal Trail at Archer and 83rd in Lemont. The sequence of bridges over the Cal-Sag Canal and the train lines have signs requiring you to walk your bike, and I would not call them luxurious or scenic trails, but they are continuous and protected. I continued my trip along the I&M Canal wondering where the access point to the forest preserve, on the other side of the canal, train track and Archer Avenue would be. And here was the one major glitch in my routing: there IS NO ACCESS. As I rode on toward Willow Springs, my phone confirmed that I had passed the point of entry to the campground. I arrived at the trailhead parking area at Willow Springs Rd, at which point I was finally able to cross the canal, but I was considerably farther up the road than I needed to be. I gamely doubled back along a narrow sidewalk on Archer Ave. Regrettably, the sidewalk came to an abrupt halt about half a mile shy of the entry to the forest preserve. If you are unfamiliar with Archer Avenue at that point, let me tell you that it is a high-speed road (40mph posted, 55mph actual) thick with cars and trucks, a rumble-strip along the narrow shoulder, and a scant weedy, thorny, bottle strewn strip of grass hugging scraggly woods along the side. It did not help that the time of day was approaching rush hour. Like any normal human being, I consulted my phone for a more sensible point of ingress to the forest preserve. There did not seem to be an obvious option. The other roads were unfamiliar to me, but I knew that a relatively short walk from where I was would put me at the park’s entrance. So, I walked. This was the most hair-raising half-mile walk I’ve ever undertaken, particularly, as one of the roadside attractions were four crosses erected to the memory of victims of automobile crashes along this very strip of road. I knew that on the way back I would have to come up with different routing. As you can imagine, I arrived at the campground with considerable relief. On the approach through the gate, the sight of the serene lake, with voices of delighted kids echoing through the woods, and rays of the late afternoon sun warming up the landscape washed over me like a soothing wave, helped me remember why I came, and made everything right again. All tent sites are lakeside! I took care setting up the tent, blowing up my sleeping pad, and making comfortable sleeping arrangements. The folded Brompton fit snugly in one of the vestibules of the tent. It was too windy to build a fire, and with temperatures quickly dropping, I was glad I brought a tiny campstove to make my spaghetti dinner piping hot. When done, I carried it (along with a paper cup of red wine I snuck in for the occasion) down to the secluded fishing dock on the lake, and enjoyed a beautiful dinner al fresco under the crescent moon. The night was cold. Official readings were in the 40’s. I stayed reasonably warm in the tent, but I was certainly glad for the extra covers I brought along. At 6am, I woke to a a silvery, frost-covered campsite, completely quiet except for the gaggle of a flock of geese overhead. Steam rose from the lake, and the rising sun gently warmed up the meadow around it. I made hot tea, and drank it while packing up my tent and planning a safer route out of the camp. I opted to take 95th St out of the campground, and Willow Springs Road back into town to join the I&M Trail. The 2.8 mile ride was much better than Archer Ave, but far from ideal. The shoulder is non-existent, however the traffic is more sparse and slower, with generally courteous drivers who gave me a wide berth. After a cold night spent outdoors, I was chilled and hungry, and definitely feeling fatigued. I had really hoped to find some great breakfast place to replenish my reserves. As it turned out, I made it all the way back to Palos Park before finding anyplace to eat. I took a short detour off the trail to visit a place called The Harvest Room, where I had about four cups of hot coffee, and a dish of food that had the word “mountain” in it. I would never wish to repeat my hike along Archer Ave. But having tried a solo camping adventure for the first time, I relish the memory of it, and plan to make time and space for many more. *Yes, this would have been totally doable by train with a little more planning. From my location on the NW side, I could have taken the Blue Line Downtown, and boarded the train to Orland Park, and connected to the Tinley Creek Trail via the Orland Park bike path. The idea that worthwhile life experiences and adventures have to involve international travel, significant investment and considerable allotment of time are damaging, and keep many of us from filling our lives with adventures right now. It perpetuates the notion that leisure and recreation can only be earned through sacrifice, soul-crushing work, and saying no to what you deeply yearn to do. So we say: say yes! Adventures lurk inside the city, or just outside of it, and even a day --even several dedicated hours -- spent relishing the outdoors, or doing something our of the ordinary, will make a difference in your week and in your outlook. This can be done on a weekend morning in cooler weather, or -- in a pinch -- early on a work-day when the days are longer. Ride your bike to a nearby beach or natural area. Depending on how much time you have, I would suggest a distance of 5-12 miles one way. Bring along a portable stove, cookware, uncooked breakfast fixings and a thermos of hot tea, or a way to make a hot beverage of your choice. A small table cloth is a nice touch. Pro tip #1: unless you have a self-staring stove, pack matches or lighter! You will not believe how delicious, nourishing and warming your meal will taste. Take your time enjoying it. Your sneaky adventure will buoy you for the rest of the day. Riding home at night on an unlit trail, with only the circle of your own bike light to guide you is a beautiful way to be alone with yourself. Why not turn bad weather into your ally? Dress for it, but don't expect to be completely comfortable. Finding a way to enjoy the experience despite adversity is what makes it an adventure. One of my favorite rides was a chilly, rain-soaked, early April small town exploration on Brompton Bikes in Fox Lake, the last stop on the Milwaukee District North Metra line. Instead of our usual 30-40 miles, we limited ourselves to about 12, including a meander through the rain-soaked Grant Woods Forest Preserve, where we ducked under a picnic shelter and fortified ourselves with a little bourbon-soaked hot tea we brought along for the occasion (highly recommended!). Dunkin Donuts coffee never tasted as good as it did while we waited for our return train. In a large city going to an unfamiliar ethnic neighborhood can be almost as exotic as an actual trip to a foreign land at a fraction of a cost. I recommend leaving your smart phone at home, and biking to an area you rarely visit. I've lived in Chicago for over 30 years, and there are still plenty of options for exploration, including Indian, Korean, Vietnamese, Rumanian, Nigerian, Middle Eastern, and many more. If you're not sure what to order, do the really adventurous thing and ask for a recommendation from the server. As a result, I once ended up confronting a plateful of very spicy but nearly raw meat at an Ethiopian restaurant. Pro tip #2: a Brompton folding bike will quickly provide a conversation opener and help to bridge any communication gap. Pick a regional train route, hop on with your bike, and go to the end of the line. Using Chicago Metra Train routes alone yields a dozen desinations, so you could try a new one every month! Once you get past the suburban sprawl, you will find that nature and open spaces are a lot easier to get to. The small town you end up in may have a friendly breakfast spot, where you can get some tips on best nearby places to disappear for a few hours. The quiet rural roads are not likely to have a lot of traffic, and the bike will easily carry you to a place where you can enjoy silence and solitude. 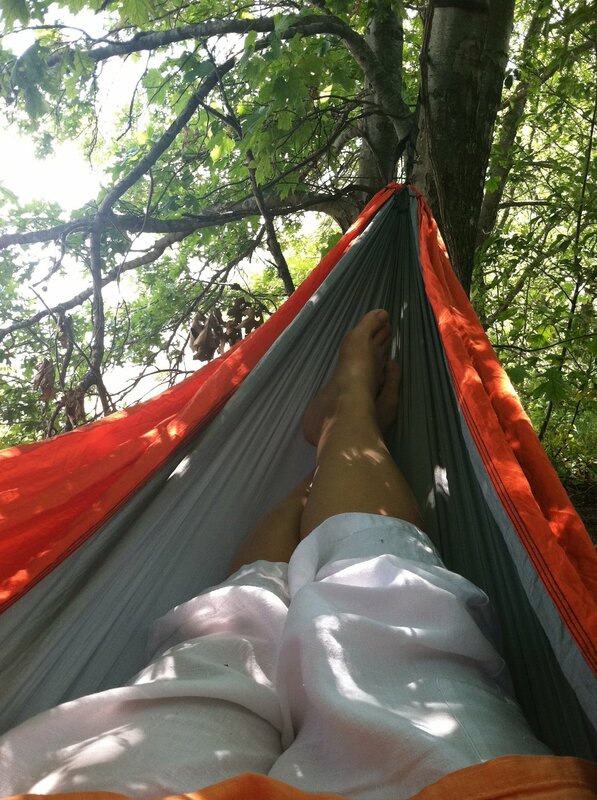 In milder weather, you can bring along a packable hammock and even enjoy a midday nap, or simply spend some moments suspended in the company of trees and birds.